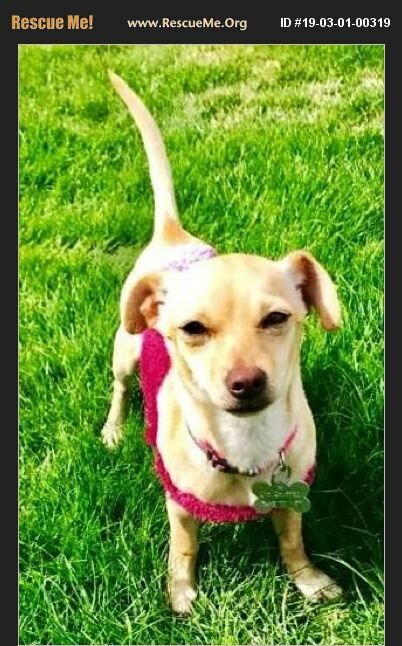 Elizabeth is an adorable 6 month old Chihuahua/ Terrier mix. She weighs just over 5 pounds but still has a little bit of growing to do. She is a timid, sweet, loving cuddle bug. Elizabeth gets along with small and big dogs and even cats. She likes men, women and gentle children. She does, however, not appreciate other dogs near her when she is in cuddle mode. Elizabeth is almost housebroken but still makes an occasional mistake. She doesn't bark much but when she does she has a unique sound. She does get a bit anxious when left alone, Elizabeth would love a home where her people are home more often than not. And like her bark, she also has a unique sounding little howl. Elizabeth likes to sleep in bed with her people at night all snuggled up next to her favorite without any accidents. She also is crate trained. Elizabeth does good on car rides and prefers to be held so that she can see what's going on. She is spayed, up to date on vaccines, microchipped, and vet checked. Her adoption comes with 30 days of free pet insurance, and comes with a free vet visit. Her adoption fee is $320. To meet her, contact her foster mom Marsha at 573-690-9648.